Size: 10.75 x 7.63 inches (with margins). From "Les Tablettes Guerrieres, Ou cartes choices, Pour la commodite Des Officiers er Des Voyageurs". A very well engraved map of North America with a small pictorial title cartouche with four Native Americans, two standing and tending a fire, two seated beneath a palm tree and with alligator and snake in the foreground. California is shown with an indented coast line. The Mississippi River is shown emptying into Texas and the southeastern coast of Texas is designated as part of La Floride. La Feuille (1640-1709), was a goldsmith, clockmaker, engraver, and publisher of atlases, and geographic and military works. 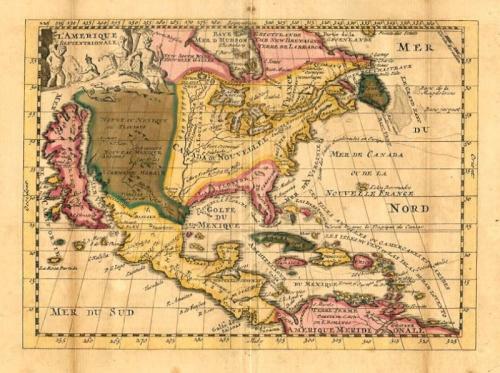 The map is in good condition with aged folds and a reinforcement of the folds at the verso.